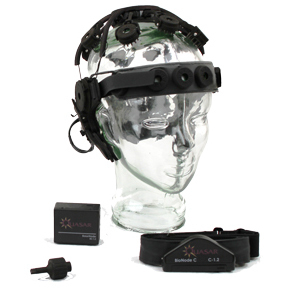 QUASAR has integrated its sensor technologies into two prototype systems for ambulatory EEG and ECG recording. • The Dry Sensor Interface 10/20 (DSI 10/20 is a headset that comfortably positions 21 dry EEG sensors according to the 10/20 International System. • The Physiological Status Monitor (PSM) is a belt that records single vector ECG along with skin temperature and body activity. Both systems use QUASAR’s low-power wireless data acquisition (DAQ) system that operates in both wired and wireless modes, and records on micro-SD cards. QStreamer is an intuitive data acquisition software designed to synchronously record data streaming from both DSI 10/20 and PSM systems. QStates is a powerful trainable cognitive state classification gauge that extracts the most salient features from EEG, ECG, EMG, and EOG data for real-time assessment of cognitive load.